I just want to relate a positive experience I had today with Danner Boots over a known issue with some boots I bought from them last year. This company embodies what Made in the USA ought to mean. Last November I decided to go with their tall Striker II GTX boots for all-weather commuting. These boots are awesome, but recently I have been popping eyelets. WTF? I did some checking and found that others reported the same problem. Danner made the boots with plastic eyelets, plastic toe, and a non-metal shank for law enforcement applications involving frequent work around metal detectors. Anyway, to my dismay I found that Danner only warranties these and other military and work boots for 180 days from purchase. I decided to send an email to them anyway and just say that the eyelets were no good but otherwise I liked the boots. About 3 hours later I got a call at work from them, and the guy said he'd send me a shipping label and advised me to send them with a brief description of the issue. He said they were taking care of the eyelet issue even in cases where the warranty period expired. They also discontinued the use of the eyelets on new boots. Oh and did I mention that the turnaround time on the replacement of the eyelets is 1-2 business days? THIS is customer service, and I continue to be a loyal Danner customer. Below is my original purchase information. I noticed on the website that the striker II GTX boot is only warrantied for 180 days so I guess I'm not covered. I just want to say that while the boots are generally quite good, the eyelets are terrible. I now have 3 that are broken simply from cinching the laces tight. I depend on these boots too so this is really disappointing. This is my third pair of Danner boots, and I'm a customer from as far back as 1995. However, I'm really disappointed in these eyelets. I cannot understand why your company would take so much care in constructing these only to finish them off with cheap plastic eyelets. It makes no sense. I understand that you tried to avoid using metal in these, but these eyelets are no good. Please include your name, address, telephone number, and briefly restate the problem you are experiencing with your boots. I sent that label your way. Please let me know that you’ve received it. We look forward to receiving your boots so that we can assist you. PS. To anyone who wants to say I should get a pair of waterproof, MC-specific boots, give me money instead kthnx. Last edited by OrangeShirtDude; October 15, 2010 at 05:36 PM..
PS. To anyone who wants to say I should get a pair of waterproof, MC-specific boots, give me money instead. in the 10+ years i've been riding i've never worn a motorcycle-specific boot (except for the racetrack). the last boot looks nice, i'll have to check it out since my current hiking/riding boots are beat to hell. You just can't go wrong with Danner. I know the military and LE guys one here know what I'm talking about. I also have the Striker II, and I love them. What happened to the eyelets? Mine have held up fine so far, I've had them about 6 months. I got mine last November, and I don't know when they changed back to metal eyelets. Mine have plastic eyelets. They were ok until about 2 months ago. I cinched the laces on one of the boots tight and heard a pop. Then later I found that an eyelet split in half with the back separating from the front. A couple more gave way this morning, and I realized I had to do something. I figured I was going to have to pay a cobbler to redo all the eyelets for me, but Danner is going to take care of it. DocZ, you know about these boots then. Toasty warm in the winter, and they stay dry in the worst weather. Dam good on them! I also have Danner boots for field work all over the world. Yet I do not wear them riding. I have motorcycle specific boots. Quite a few pairs really. A few ...just a couple!! I will check out a set. They aren't the cheapest, but a great feature of Danners is that you can have them resoled. Danner stitches their soles (typically made by Vibram) to the uppers in an age when nearly all soles are glued to the uppers by other makers. I heard about Danner but never really got into their products. I guess I've been in Timberland for so long it's hard for me to break the cycle. Good customer svc. story though. UPDATE: They sent me a UPS shipping label so I boxed up the boots and sent them out to Portland, Oregon. Never got my boots back... What I did get yesterday though is a brand new pair of replacements. I thought they were going to replace the eyelets, but they sent me a brand new pair of boots, and it didn't cost me a dime. 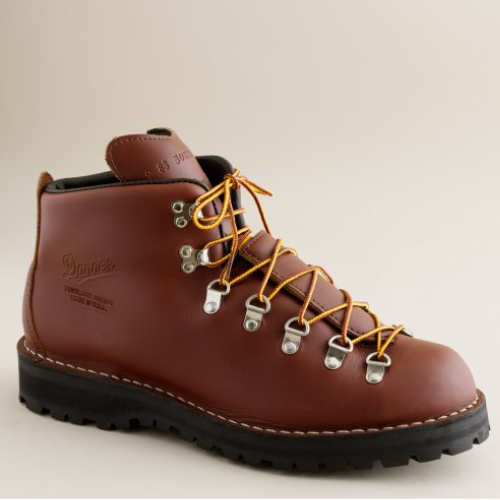 Wow, I'm definitely going to buy Danner again, and I'll buy direct to boot (pun intended). Awesomeness!!!!!! You can't ask for better service than that!! Man, I love when that happens! Nike did that for me once when the air capsule on my Air Hyperflights developed a hole. Props to Danner for stand-up customer service. Especially since I spilled about this time last year behind my building at work and scuffed the boots up pretty good. I only had them a month and was so sad. All behind me now though. Can you get them local? If not how true to size is the fit? I got flat wide feet. Need a good pair of utility boots and this kind of praise sells me.